If your keyboard is starting to show its age, collecting dust and looking like something from a horror film, you might want to think about picking up one of the best keyboards. Even if you don’t’ have a keyboard that’s on its last leg, the benefits to comfort, speed and reliability you gain with one of the best keyboards easily pays for the cost of admission. And, trust us: once you’ve used one of the best keyboards for yourself, you’ll never want to go back. Regardless of whether you’re writing up a term paper or just chatting with friends, the best keyboards will make your life so much easier. And, we’ve got you covered if you’re looking for a sick gaming keyboard, too. The Realforce, manufactured by the Topre Corporation in Japan is truly a force of nature. This is thanks to the unique Topre switches, which are smooth to type on and are typically compared to playing on a piano. The RealForce comes in both 45 and 55 gram configurations, but the one that’s right for you will depend on the importance of key weight. Oh, and it’s expensive – but the price is worth it for a keyboard this good. 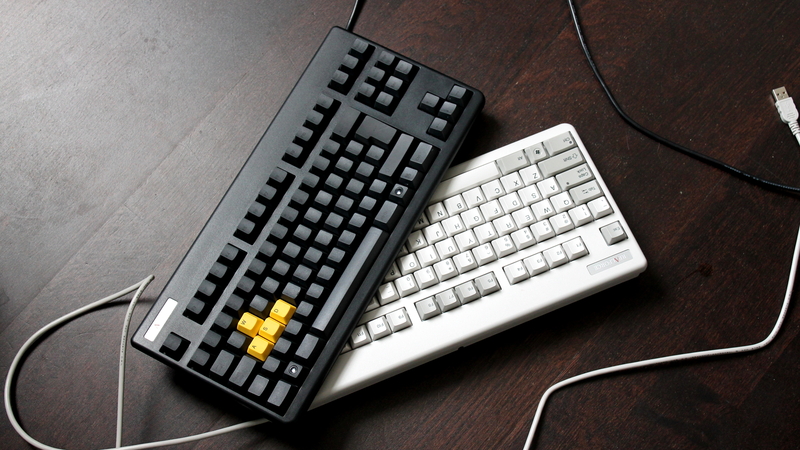 Filco’s keyboards tend to be built like tanks, and the Majestouch TKL is no different. This space-saving mechanical keyboard features a compact tenkeyless design that has less than 1cm of space between the edge of the keys and the keyboard. Its durability doesn’t simply allow it to stand up well to knocks and scrapes – it has a positive impact on its typing feel too. You can hammer away on it at speed, even bottoming out to your heart’s content, and the Majestouch 2 will take every bit of punishment. Somewhat legendary in keyboard circles, the PFU Happy Hacking Professional 2 (or HHKB2 as it’s usually referred to) is that rare beast – a 60% Topre keyboard. Aimed at coders but fantastic for document warriors too, it foregoes traditional arrow keys, instead making use of function keys and key combinations to provide such functionality. It only takes a short while to get used to, once you’ve got there the huge benefit is that the HHKB2 is small and light enough to take anywhere, giving you access to that sweet Topre “thock” sound and feel anywhere, anytime. Leopold’s Fc660c is more portable than the Realforce 87u, but less so than the lighter and more compact HHKB2. However, the Fc660c benefits from its extra heft and feels like the more solid board. Despite having the same 45 gram actuation force as the HHKB2, the Leopold’s keys feel slightly weightier – somewhere nearer to 50 grams. It results one of the most satisfying “thock” sounds on a Topre board. Some keyboards just ooze class, and the Das Keyboard Prime 13 is one of them. Its features a solid aluminum top panel for added rigidity and a very minimalistic look. With Cherry’s MX Red or Brown switches under the keycaps, you’re given a choice between linear and non-linear offerings with a range of actuation points. It’s a great option for media enthusiasts thanks to side lit media control and the inclusion of white backlighting is another bonus. It’s not the most affordable keyboard on our list, but if you’re looking for something a little bit more premium, Das is the way to go. The K780 can still pair with up to three devices using Bluetooth or wireless, allowing you to chop and change between them, and it features the same comfortable rounded keycaps that remain a pleasure to type on. The star of the show, however, is the keyboard’s base, which can hold mobile devices up to 11.3mm thick in an upright position. This places them within arms’ reach to make anything from replying to WhatsApp messages or reading a digital magazine easy as pie.